In this station a figure for the halma game will be created. It is a composition from mesh objects (primitives). Create a composite pice as shown in this learning unit. Move the new object with the mouse. Join the parts and name the object »halma_figure«. Move the new object again. Duplicate the object and have a look at the counter in the header of the info window. Selecting the context is the first step. Next step is creating and positioning objects. The context is assigned to a variable named scn. 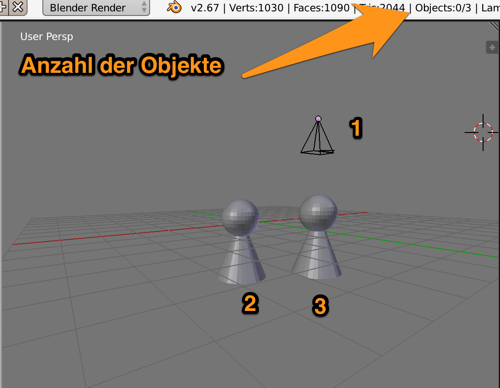 If you name the objects, later on it is easier to select one of them. The sphere is the first part. We also scale the object afterwards and name it »head«. Same procedure as with the first part. Let’s have a look to the final version. Are all pieces on the right place and have the right dimension? The old objects are deleted, so a frech and empty scene is used. You can check the info window. There are also statistics about the number of objects. Add the following lines of code to glue together the two pieces to a new one.